Lamb is one of those meats that is so under utilized. Whether people feel that it should only be served in its traditional form, roasted with mint sauce, or if its considered a more holiday meal, it just isn't found that often in new formats. So, when the American Lamb Board contact me a while ago to enter their contest to start coming up with new ways to serve lamb- I jumped at the chance. Lamb is a strong flavored meat- presenting more flavor than pork, and and a richer feel than beef, it can be prepared in many of the same ways making it a perfect alternative to the tried and true. 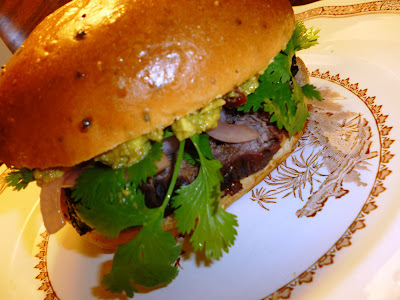 I was sent a boneless leg of lamb and I knew what I wanted to do- I wanted to make a sandwich that would rival a burger- the typical summer barbeque food. I wanted something that would bring in all those wonderful summer flavors, and something that would be easy to assemble for the hungry masses. The great thing about leg of lamb is that it's a usually a pretty big piece of meat. It is easy to marinade and then set on the grill for it to cook to a perfect medium rare. The flavors here are light and accentuate the denseness of the meat. Here we use sweet orange juice, smoky chipotle peppers, refreshing cilantro and spicy pickled onions to enhance and complement the flavor of the lamb. Toss the onions in dry ingredients and then place in a small air tight container and fill with vinegar. Store in the refrigerator, shaking to stir every so often. Combine dry rub ingredient and rub into lamb. Place the lamb into a Ziplock bag pour in the oj until the meat is just covered. Let rest in fridge up to 24 hours. Remove meat from marinade and dry lightly with paper towels. Place in pre heated grill with the fat side up. Depending on size of your leg, turn after 20-25 minutes and cook on the other side. Monitor the lamb until done-the inside temperature should read 145 for medium rare. Remove from grill and set aside to rest. Combine mashed avocado, pepper and sauce. Spread onto one side of bun. Top with a few pickled onions, fresh cilantro and slices of the lamb. Finish with the bottom bun and enjoy. Love the look of this sandwich! I am cooking my dinner up tonight! I love lamb and don't cook with it nearly enough. Thanks for the idea! i'm a newcomer to lamb, but have definitely enjoyed it the few times i've had it. this looks like something i'd definitely like to try!! Thanks for posting this. Lamb is a leaner alternative to meat. Can't wait to try this.